You can't beat the treat that's Bubba Kush but you can add to it, she has rock solid fat nugs some of the strongest most sort after on the planet. 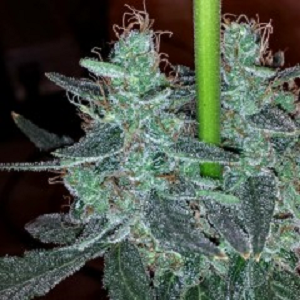 Strawberry Bubba Diesel Feminized Marijuana Seeds by Holy Smoke Seeds: You can't beat the treat that's Bubba Kush but you can add to it, she has rock solid fat nugs some of the strongest most sort after on the planet, it's sweet creamy coffee tones mask a very strong medicinal indica world renowned. The beautiful deep flavour of Strawberry Bubba Diesel is an organic strawberry wine of such beautiful aromas fragrances and tastes that flood the pallet with gorgeousness it's like lighting up a strawberry sunset it's tremendous. Phenos ranging from a deep blue tinged strawberry cream to a cherry strawberry wine honestly these flavours melt on your tongue. The stone phases through you In waves at first building till the tide surrounds you washing a superior state of being over you you'll laugh out loud or grin from ear to ear you might even cry a little such is the presence of this mighty strains vibration. She sure likes to grow too, the Strawberry gives the Bubba new legs and keeps the buds pointing at the Sun and pushing into giant fingers, she's an easy feeder too and really doesn't need a whole lot of attention she knows what to do and time and again she will perform for you these buds will make friends out of complete strangers, the testers fell all ova each other trying to get to these!